The Turks & Caicos Islands Tourist Board in collaboration with the Ministry of Tourism, Environment, Heritage, Maritime and Gaming commemorated the commencement of Tourism Environmental Awareness Month (TEAM) with the announcement of the winners of the first TEAM song competition. The competition, which was launched in September and had a submission deadline of October 19th, was issued to public and private primary schools throughout the Turks & Caicos Islands. The schools were tasked with composing an original song based on the theme ‘Tourism Is Key, It Starts With Me’. The Tourist Board received submissions from Ianthe Pratt Primary School, Enid Capron Primary School, Oseta Jolly Primary School, Mills Institute, Richmond Hill Preparatory School, Precious Treasures International School, Ona Glinton Primary School and Iris Stubbs Primary School. The stiff competition was examined by a panel of judges. 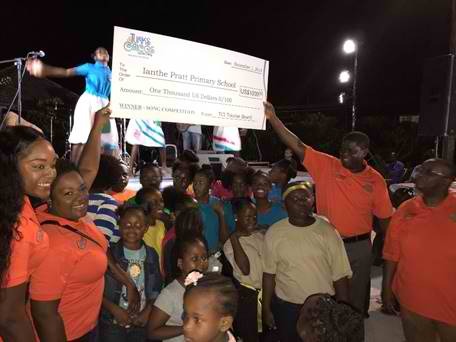 The Ianthe Pratt Primary School emerging victorious and was presented with the $1,000 prize from the Turks & Caicos Islands Tourist Board. The announcement was made at the launch of TEAM at the Island Fish Fry on Thursday November 1st and a formal check presentation occurred on Monday November 5th. The songs were judged on criteria which included quality of tone, technique, communication, musicianship, stage presence, originality and time. Ms. E. Blythe Clare, Training Manager at the Tourist Board and coordinator of TEAM, remarked “We were very pleased with the quality of the songs that were submitted and the competition was very tight. On behalf of the Tourist Board, I express my appreciation to all of the schools who participated and extend thanks particularly to the teachers who worked tirelessly to prepare for the competition”. The Tourism Environmental Awareness Month Song Competition was introduced for the first time this year and complements month-long activities throughout the Turks and Caicos Islands. The winning song, in addition to all the other songs submitted will be played on Radio Turks & Caicos throughout Tourism Environmental Awareness Month. Additionally, the participating primary school choirs will be the featured performers at the Island Fish Fry every Thursday throughout November in Providenciales. 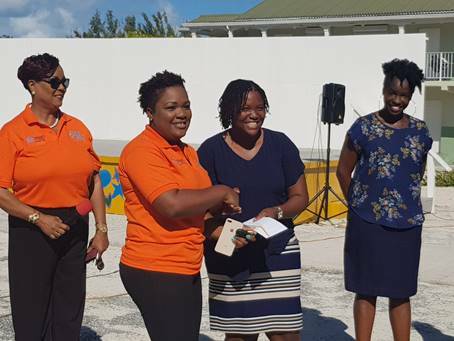 E. Blythe Clare, Tourism Training Manager and Diedra Been, Financial Controller of the Turks & Caicos Islands Tourist Board present the prize of $1,000 to Mrs. Wright, music teacher and Ms. King, principal of the Ianthe Pratt Primary School. Ianthe Pratt Primary School performed and was announced as winners of the Tourism Environmental Awareness Month song competition at the Island Fish Fry on Thursday November 1, 2018.